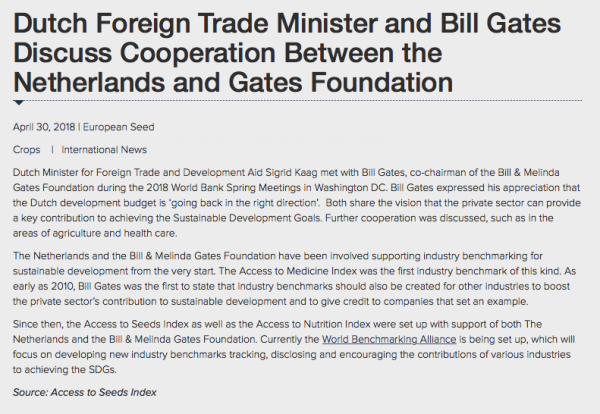 Dutch Minister for Foreign Trade and Development Aid Sigrid Kaag met with Bill Gates, co-chairman of the Bill & Melinda Gates Foundation during the 2018 World Bank Spring Meetings in Washington DC. Bill Gates expressed his appreciation that the Dutch development budget is ‘going back in the right direction’. Both share the vision that the private sector can provide a key contribution to achieving the Sustainable Development Goals. Further cooperation was discussed, such as in the areas of agriculture and health care. The Netherlands and the Bill & Melinda Gates Foundation have been involved supporting industry benchmarking for sustainable development from the very start. The Access to Medicine Index was the first industry benchmark of this kind. As early as 2010, Bill Gates was the first to state that industry benchmarks should also be created for other industries to boost the private sector’s contribution to sustainable development and to give credit to companies that set an example. Since then, the Access to Seeds Index as well as the Access to Nutrition Index were set up with support of both The Netherlands and the Bill & Melinda Gates Foundation. Currently the World Benchmarking Alliance is being set up, which will focus on developing new industry benchmarks tracking, disclosing and encouraging the contributions of various industries to achieving the SDGs.